Here Texas is in a 3-2-6 Dime personnel on 3rd & 14. 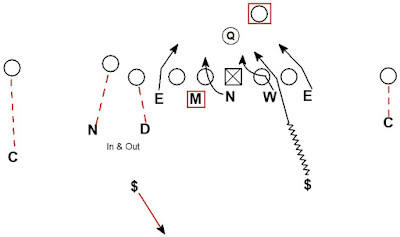 The Nickel and DIme appear to signal an "In & Out" combination coverage on the closely aligned #2 and #3 receivers. The Mike is mugged up on the guard while manned on the RB. Post-snap the Mike green dogs and adds to the pass rush. The mugged up LB's gets the OL into a 5 vs. 5 situation. Every OL has an immediate threat to block forcing them into 5 games of 1 on 1. The occupied OL force the RB into blocking the blitzing safety. 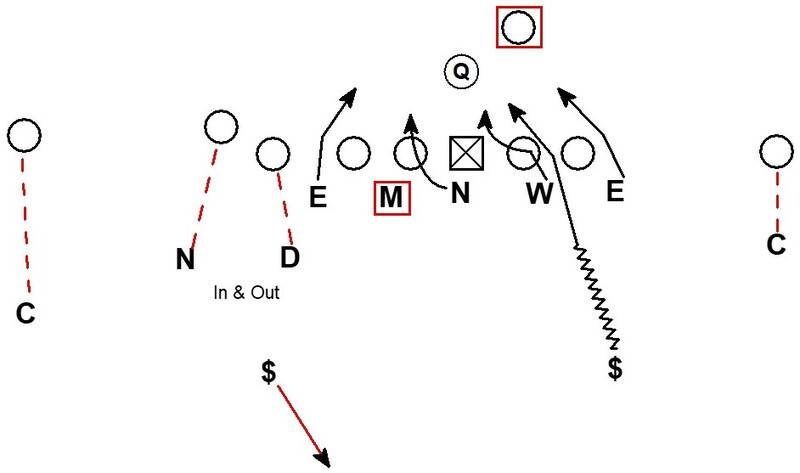 In coverage the In & Out has a hard route combo to handle with both #2 and #3 running inside breaking routes. Fortunately, the pressure hits home before the routes can come open. Good stuff from Coach Orlando and the Longhorns.